When Downton Abbey ended its first series, little did I suspect that a companion book was in the works. Once news of the book was confirmed, and its cover and drop date released to the web, I was determined to interview its author, Jessica Fellowes. The wonderful closeness of the world wide web made this easy, and I promptly typed up an email, nervous and hopeful that she would be available! Needless to say, she was, and her response was interesting, enthusiastic, and made me even more excited to watch the upcoming season! 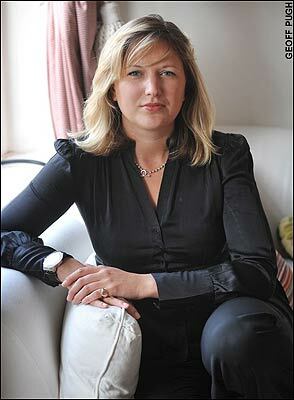 Bio: Jessica Fellowes is an author and freelance journalist. She is currently writing ‘The World of Downton Abbey’, based on the hit ITV series, to be published by HarperCollins in September 2011. Jessica’s next book is ‘The Devil You Know: Looking Out For The Psycho In Your Life’, co-written with the forensic psychologist Kerry Daynes, it is published by Hodder and out May 12 2011. Formerly the Deputy Editor of Country Life, she has also been a columnist for the London Paper – her columns formed the basis of her book ‘Mud & the City: Dos and Don’ts for Townies in the Country’, published by Book Guild. She also writes for the Daily Telegraph, Telegraph Weekend, Psychologies and The Lady. Before writing the companion book to Downton Abbey, were you familiar with the Edwardian era? My favourite authors are from around late Edwardian time up to the second world war – from Edith Wharton and EM Forster to Graham Greene, PG Wodehouse, F Scott-Fitzgerald, Evelyn Waugh, Dorothy Parker… – so I had a general sense of that time already. Plus I was familiar to the degree that my grandfather was born in 1912 and Julian (Fellowes, who wrote the television series and is my uncle) has always had an interest in that period, so they both sparked a curiosity in me for that era. There is something in the nature of that time’s reaction to the Victorian sensibility, the partying heyday of King Edward VII and general naughtiness of the first decade that was then rushed headlong into a world war and all the ensuing tragedy, that is very compelling. But much of what I learned of the Downton Abbey time (1912-1919, for the purposes of this book, covering series 1 and 2) was new – and fascinating! What did you most enjoy about writing the book? Did you come across anything surprising over the course of actually researching and writing the book? I really felt very privileged to write this book because it gave me such a wonderful excuse to indulge in reading about and around that time. What I really loved was reading memoirs of people at that time that are now beginning to be republished, which I’m thrilled about – there are some extraordinary voices out there that have been silent for such a long time. The lady’s maid, Rosina Harrison, who worked for Lady Astor at Cliveden, as well as all the male staff she interviewed for a book. The sad but illuminating tales of Lady Diana Manners, Consuelo Vanderbilt and the Countess of Warwick. I think the thing I found that was not so much surprising as revealing was that there is a general assumption now that people 100 years ago sat within the class system as we see it now. That is, that to be a servant must have been a demeaning and awful life and that everyone else was a heartless aristocrat. Of course, they were just as human as we are in the 21st century – some enjoyed the life, some didn’t; some were nice, some were horrid; some fought for change, others preferred to leave things as they were. I think we often patronise the people of the past and we are deeply wrong to do so. The thing I also found really interesting were the parallels between then and now. While the look of everything circa 1912 feels positively ancient – corsets and top hats – it wasn’t that long ago, just two or three generations. And they were living in times of huge scientific and technological change which impacted on the way they organised and lived their lives, just as we are now. Did you expected Downton Abbey to be so popular? Why do you think it struck a chord with so many people across the globe? Well, as Julian said when welcoming the cast back to the first script reading for series two (when the first one wrapped, of course, no one knew what the reception would be like – they departed unknowns and came back together as huge stars), one doesn’t like to say that one didn’t expect it to be a success because that makes it sound as if one didn’t have faith in it. But the reception it received did feel extraordinary – like some fairy tale where all the wishes come true at once. I think that there is a combination of factors that all just came together at the right time: a great script, beautiful location, gorgeous actors and costumes – these are all a part of it. But where Julian and Gareth Neame (the executive producer) were so clever was in giving all of the characters, above and below stairs, equal weight. There is a fascination with class still and in our rather pressured and constantly changing times we do hark back to the old days and wonder if they did everything so much better. On top of all that, there was something wonderfully cosy about everyone sitting down and watching the same programme on Sunday nights. What are some things readers can expect in the official companion book? I really hope readers feel they get a lot from the book. We (that is me, and the amazing team at Harper Collins that put it all together) wanted to do more than just a ‘making of’ book. That element is certainly there but we put something together that has three major layers – the series itself, in which we discuss the characters and the storylines of both series, looking at backgrounds and motivations; the cast and crew, where we see how it was put together and explore the locations and costumes; and, finally, the context of how life actually was at that time, with stories from real-life counterparts. These layers are sandwiched together with sumptuous photography and period illustrations. It was very hard work putting something like that together in record time but I’m thrilled with the results. Who is your favorite character and why? On that note, who is your least favorite character? Well, you’re not quite asking me to name my favourite child, but….! It’s hard for me to say because I have such a different relationship with the characters now – it’s so much more than having simply watched them in the programme. And I hope readers at the end of the book will feel the same way as I do. I researched so much into what Julian’s ideas of their backgrounds were, what the actors thought in playing them and then in looking at how life would have been for them then, that you feel something for all of them. Even the bitter and twisted Miss O’Brien has her sympathetic side (admittedly, you have to look hard for it) – and I admire her, because she’s at the top of her career tree and she would have worked hard and sacrificed a lot for that (not least a husband and family). No, I’m sorry – I just can’t select two in that way! They’ve all got something one enjoys watching and hearing about. When watching the first series, what are elements you hoped series two will explore? 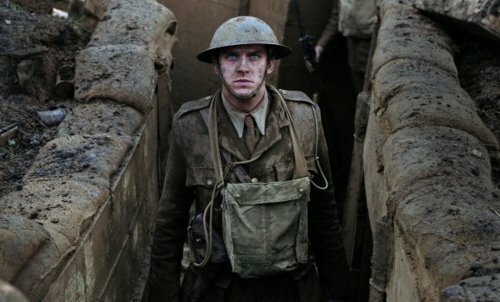 We knew, of course, that we would be going in to the First World War for series two, and I was fascinated to see how Julian and the production would handle that. I think they’ve done it brilliantly. The horror of war is in both the statistics and the individual stories and they’ve conveyed both aspects very movingly. I was intrigued to see how the characters would handle the demands of war – from Violet who detests change of any sort to Daisy and her superstitious fears. No one is left untouched in that regard, and I think viewers will find that gripping. At the same time, it is not overtaken by the war – we still get to enjoy the beautiful world of Downton Abbey, the girls still have wondrous clothes and the romantic tangles are just as entangling….What more could one want?! Sum up why we should rush to buy “The World of Downton Abbey” in less than ten words! Because it’ll make watching it even better. Visit Jessica on her website or follow her on Twitter. 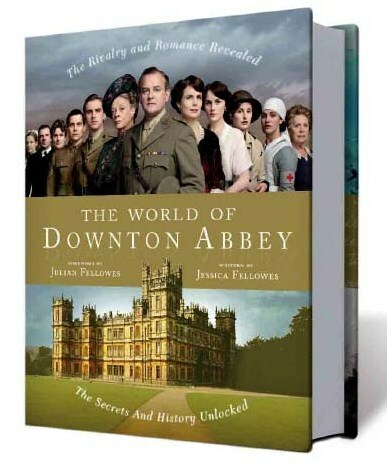 Purchase The World of Downton at Amazon.com, Amazon.co.uk, or The Book Depository US. The audiobook (read by Elizabeth McGovern!) is also available through Amazon.co.uk or The Book Depository. New interview with Jessica about the new Downton Abbey companion book, The Chronicles of Downton Abbey. Nice interview! I hope Jessica can join in if/when we have another DA twitter party for the second season in the US. Thank you. I hope she can join us on Twitter either when it airs in the UK or when it airs in the US! Since the book isn’t being published in the States until December (Yikes!) I will be ordering this as my birthday present along with the Season 2 DVD (which comes out in November!). Sounds like an excellent gift! Hopefully the US DVDs will be packaged as nicely as the Brits. I much enjoyed dipping into a copy of Jessica Fellowes’s book The World of Downton Abbey, but was startled by the caption stating that Lord Grantham’s mess dress was: “copied from one that was worn by an officer in the Indian Guides in 1912”. It is in fact the mess dress of a field officer of the Grenadier Guards, the regiment in which Lord Grantham had served previously during the Boer War, and is of the pattern still worn today by all officers of the British Army’s five regiments of Foot Guards. The only difference between the regiments is the insignia worn on the lapels of the dark blue shawl collar; in the case of the Grenadier Guards, a gold grenade as shown on Lord Grantham’s jacket. The three rows of gold braid on the blue cuffs of his jacket denote that he served as a field officer (major or lieutenant colonel) – captains wear two rows and subaltern officers (lieutenants and second lieutenants, or ensigns as they are called in the Foot Guards) wear a single row. I served as an officer in the Irish Guards and wore the same mess dress, the only difference being the regimental insignia on the collar – ours being the St Patrick star. The mess dress of the Indian Army’s Corps of Guides was very different, being of a distinctive sand colour that was standard for all of the Guides’ uniforms.